Cladestine Cake Club & Coronation Chicken Cake! 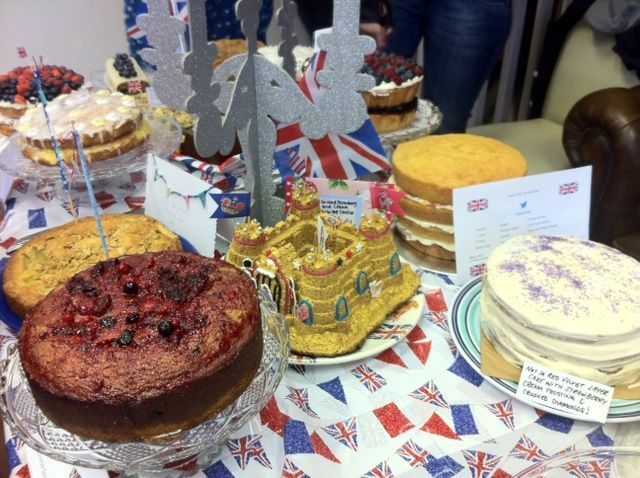 The Bolton branch of Clandestine Cake Club were feeling a tad patriotic for this month’s meeting as the theme was the Royal Jubilee! Once again Rachel organised a brilliant venue- the very cute Cherry’s Coffee Shop in Westhoughton. It was a brilliant mix of cakes including: an amazing Battenberg with a union flag running through the middle, a four layer sponge with a layer each for England, Ireland, Scotland & Wales, a royal castle bundt (Rachel of course- she is bonkers for a bundt! ), a sponge beautifully iced with bunting around, English rhubarb cake, a white chocolate and strawberry and so much more. It was a great couple of hours as always, there were loads of new faces and it was good to see the blokes getting stuck in too – I think we had three this time! I really like the fact that I go now and recognise people and we can chat and catch up. It really is a great way to spend a few hours. So what did I make? Well a few weeks ago I had an idea that my cake would be inspired by the dish made especially for our queen sixty years ago: coronation chicken. No, it wouldn’t have chicken or curry in, but mango and raisins can only be a good thing right? Firstly, I had to crack making decent Victoria sponge. They’ve been a disaster for years, but I used a recipe in the Leon Cakes & Puddings book- 6 eggs, 350g each of butter, sugar and s.r flour cooked low and slow. Result! My only change was to add lemon zest. Next came the filling. It turns out that mango jam is all but impossible to buy so I had to make my own filling. I pureed a punnet of mango cubes into a smooth paste, added icing sugar and boiled gently to thicken. I then pulsed some more fruit but left it a bit chunky for texture and mixed the two together. Raisins were soaked in Grand Marnier and vanilla was added to the cream for a bit more flavour. It was nice and light and only ruined by my disastrous attempts at decoration! 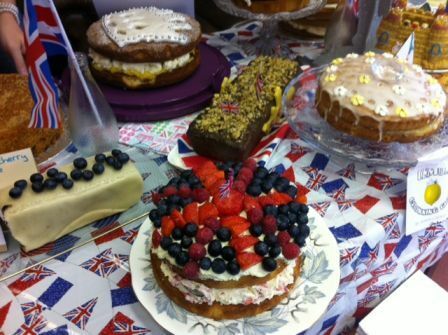 If you’ve not experienced a Clandestine Cake Club, yet check out the website for an event near you. You don’t have to be a master artisan baker (god knows I’m not) and it’s not a competition. One important tip if you’re attending a cake club. Cake, in large quantities, is a bit like alcohol. It’s best not to go in with an empty stomach (although that seems counter intuitive) because, as I found out yesterday, cake in an empty stomach leads to sugar shakes, and a banging headache! Best to have something light (and savoury) a few hours before. I wish I was a member of a cake club, looks like such fun! These creations look amazing. You should set one up- there are clubs all over the world now! You’d be made very welcome at Bolton should you want to make a trip across the world to visit!